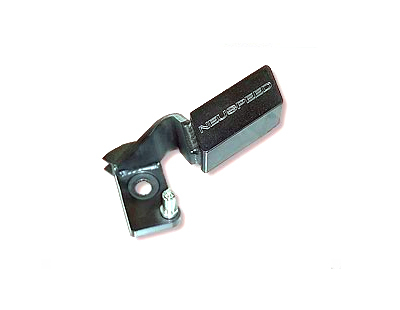 The Neuspeed short shift kit for the 2002-up Audi TT FWD, Beetle, Golf IV and Jetta IV consists of a new steel bracket assembly that easily installs on to transmissions selector shaft. The Neuspeed short shift kit reduces the throw length between gears by approximately 40%. A calibrated counterweight is welded to the end of the Neuspeed bracket to retain a solid feel from gear to gear. To determine if this kit is the correct application for your car, first find your factory shift bracket assembly located on the top of your transmission. This bracket is visible by looking below your airbox and battery. Inspect the stock cable linkage that connects to the factory bracket. If the stock cable end has a stainless steel clip, your car has a pin stud mount and this is the correct kit for your car.